Back when I was a young person, the dominant entertainment medium was a wonderful contraption called “television,” which gave a worshipful and easily led public everything it ever needed, from both an emotional and entertainment standpoint. And the news! The news was of such peerless high quality and impeccable taste that you couldn’t believe it! Good work was being done, even then, in the pre-taping of television shows with VCRs, but audiences were nevertheless largely dependent on the whims of television programmers. 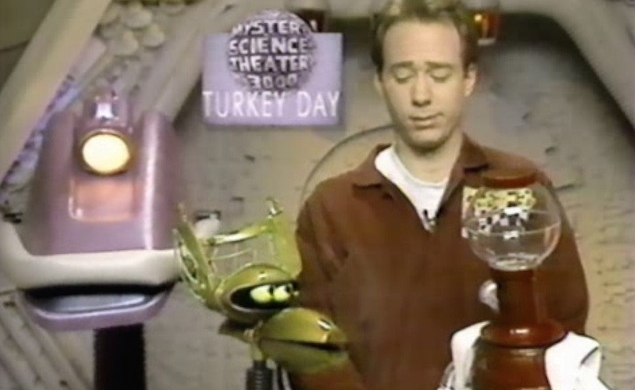 Sometimes those television programmers were very benevolent, as when they afforded a grateful America an opportunity to avoid awkwardness/time spent with family on Thanksgiving by programming a massive Mystery Science Theater marathon appropriately known as Turkey Day. From 1991 to 1997, the marathon allowed the socially awkward to distance themselves from their birth relatives and spend some time with folks they really loved and cared about: The cast of Mystery Science Theater 3000. The fun will begin Thursday, November 27 at 9:00 PT/noon EST here, as well as on YouTube. In what we imagine is a not unrelated development, the next Mystery Science Theater 3000 box set from Shout Factory will be the Turkey Day Collection, available November 25. Finally, an opportunity to do online what you used to have to do in front of an actual television set!